The BJP views Yashwant Sinha's outbursts against Finance Minister Arun Jaitley as being "purely disgruntled remarks of an individual who seeks some participation in the government and is not provided for," Mr Rao said. Hyderabad: Telangana BJP spokesperson Krishna Saagar Rao said today that senior leaders Yashwant Sinha and Shatrughan Sinha should resign from the party if they have "problems" about governance and are not finding enough opportunities to raise issues at party forums. Mr Rao said both the leaders have crossed the party's disciplinary line long ago -- "lakshman rekha", as he put it. Criticising Finance Minister Arun Jaitley over the implementation of the Goods and Service Tax (GST) and calling it "deeply flawed", Yashwant Sinha said yesterday that countrymen can rightly demand he quit for the hardships caused and also felt that he is a "burden" on the people of Gujarat. Mr Jaitley is a Rajya Sabha member from Gujarat. Actor-turned-politician Shatrughan Sinha, a Lok Sabha member, said recently that the BJP would be able to live up to the expectations of the people only if it ceased to be "a one-man show and a two-man army." The BJP views Yashwant Sinha's outbursts against Finance Minister Arun Jaitley as being "purely disgruntled remarks of an individual who seeks some participation in the government and is not provided for," Mr Rao told news agency PTI. "So, only out of that disgruntlement -- that he is not being considered for administrative or ministerial position -- he is attacking the government, the Finance Ministry and Arun Jaitley. Otherwise, how does it substantiate that his attack is only coming at election time?" he asked. 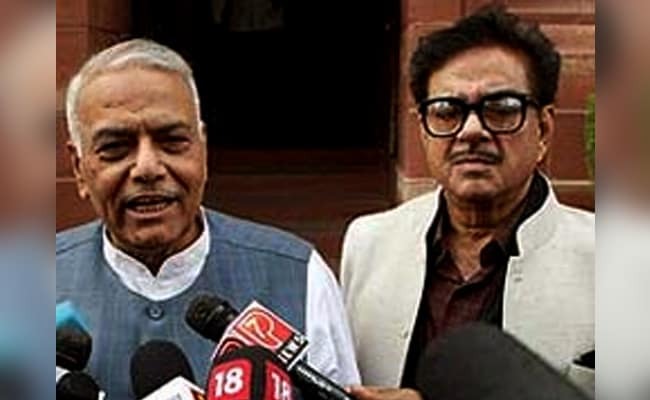 "Whenever the BJP goes for election, that is the exact time Yashwant Sinha or Shatrughan Sinha make remarks like these. It happened during Bihar, Uttar Pradesh and now it is happening during Himachal (Pradesh) and Gujarat polls," Mr Rao said. "It goes to show that there is a devious plot which is unfortunate that they are trapped in. The BJP considers that somebody else is using them," he said. Mr Rao said if the two leaders were so disturbed and peeved by the way the government is being run, they, being members of the National Executive Council and Yashwant Sinha also being member of "Margdarshak Mandal", should have raised the issues at party forums, which gives them many opportunities to do so. "While he (Yashwant Sinha) does not do that, he only uses media to attack our own leaders. It goes to show that there is a deviant plot, they (Yashwant Sinha and Shatrughan Sinha) have become puppets in the hands of 'special interest forces' in the country," the BJP leader said. Noting that the two are very senior leaders, Mr Rao said if the party has to take action against them, it has to be discussed at a wider level and the decision cannot be knee- jerk, which the BJP would not indulge in. "An ideal situation is that they resign from the party. They should take a call, if they have so much of problems in governance and they are not finding enough opportunities to voice within the party, they should resign," he said.